The K&N E-4142 fits some Briggs & Stratton 110900, Briggs & Stratton 111700, Briggs & Stratton 112000, Briggs & Stratton 114000, Briggs & Stratton 130000-132000, Briggs & Stratton 60000, Briggs & Stratton 80000-93000, and Briggs & Stratton 92000 models. See vehicle applications for details. 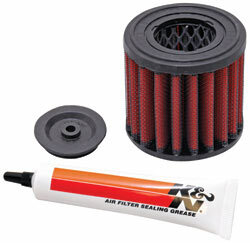 The K&N E-4142 replacement air filter is constructed with an oil free synthetic media. It has an inner wire support that provides extra strength to protect the filter under extreme conditions. A tube of grease is provided in the packaging so that there is an airtight fit in case of severe vibrations. The E-4142 fits several Briggs and Stratton lawnmowers, including the 4 horsepower model, as well as other applications. An adapter is included for applications that may require a closed off air filter. The E-4142 provides superior filtration protecting your equipment's engine to insure it will last a long time. This K&N air filter can be cleaned and used again and again saving you money in the long run.